Flavorful salmon rolled up in kombu and tied with kanpyo (gourd strips), Salmon Kombu Roll is a traditional Japanese dish for the New Year. 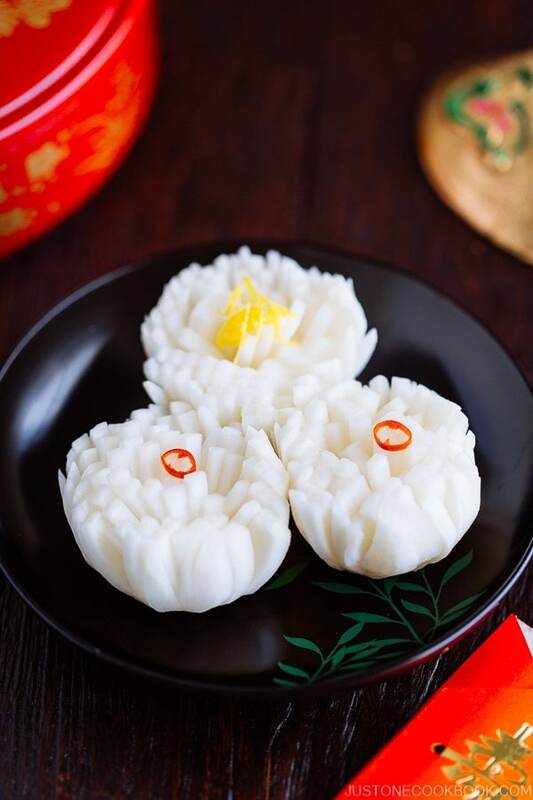 Representing the secrets of perennial youth and long life, you may be tempted to devour more than one of these exquisite appetizers. 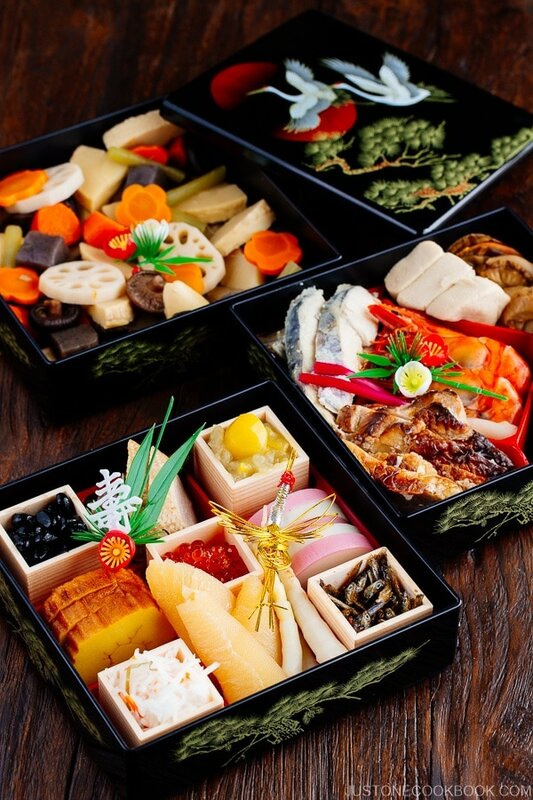 Osechi Ryori (Japanese New Year Dishes) is not complete unless Kobumaki (昆布巻き) is packed in the osechi box. 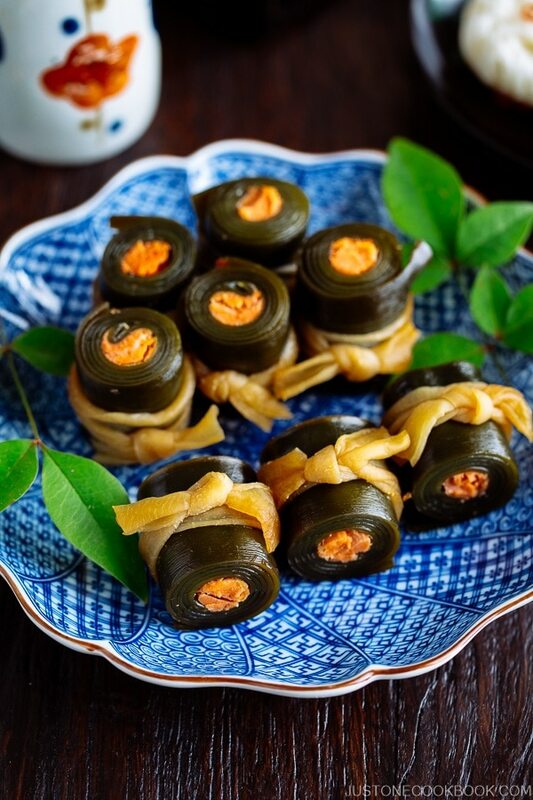 Kobumaki is basically a umami-rich kombu (edible kelp) that’s rolled up and simmered in dashi soy sauce. Today’s dish Salmon Kombu Roll (鮭の昆布巻き) is a fancy version of Kobumaki which features salmon fillet tucked snugly in the center of kombu roll. 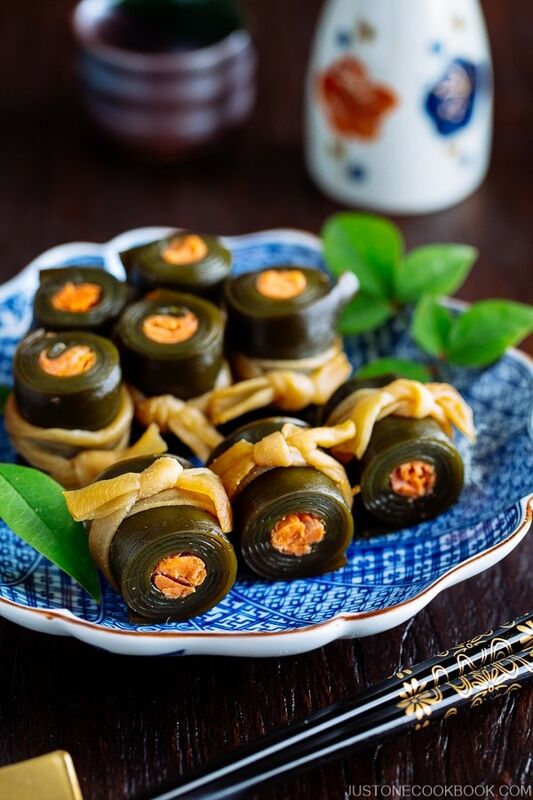 Not only it’s one of the popular Osechi Ryori dishes to welcome the new year, it also makes a fantastic meal to enjoy on its own. 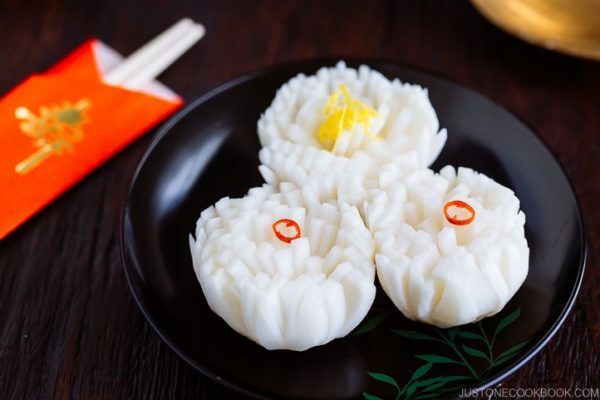 As I mentioned in my Osechi Ryori posts, each ingredient and dish for Osechi Ryori has been carefully selected for their symbolisms that carry auspicious meaning to usher in the new year. This Salmon Kombu Roll is no exception. Eating kombu is believed to bring happiness for the new year as kombu (or sometimes called kobu) has the same sound as the Japanese word Yorokobu, which means to be happy and joyful. 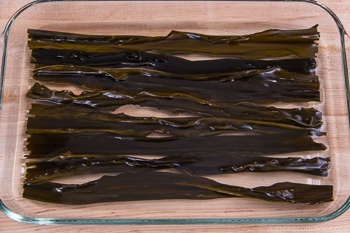 Japanese kombu is cultivated mostly in Hokkaido (北海道), the northernmost of Japan’s main island, and used quite extensively in Japanese cooking. Although much is not discussed, there are different types of kombu. Each kombu has slightly different flavors and textures. 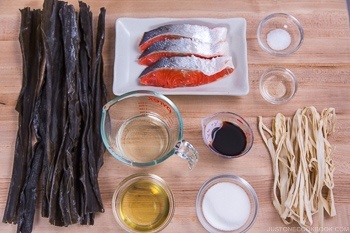 Ideally it’s best to use specific kombu that is called for in each different recipe. For this recipe, Hidaka Kombu works the best as it is tender, more flexible, and easy to fold up. They come in different width and length, so don’t worry too much about making all the kombu rolls in equal size. Some may turn out to be longer, some fatter… they are all made out of love and that’s what make them special. 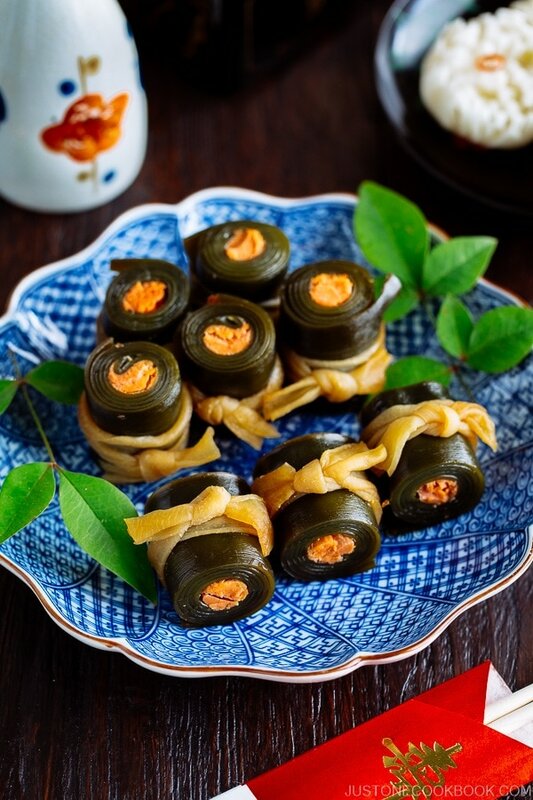 Kanpyo is a Japanese ingredient that you don’t see very often in day to day Japanese foods. 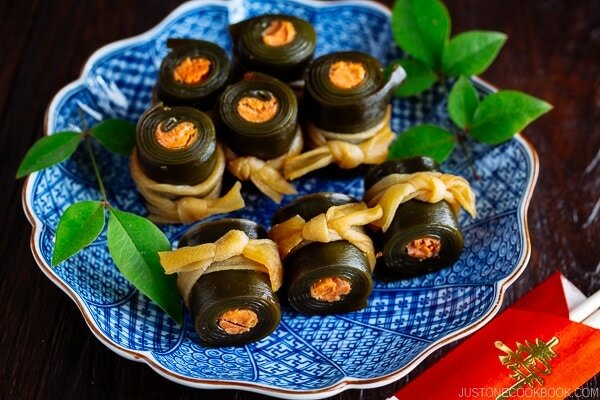 Typically used in traditional sushi recipes, you may have seen it in Futomaki (Thick Sushi Roll) and Chirashi Sushi. Over here, it is hydrated and used to tie around the middle of Kobumaki that resemble the pattern of kimono sash. Kanpyo is a dried ingredient and can be found at the dried food section at your local Japanese grocery store. If you can’t find kanpyo, you can try using toothpicks or cooking twines to secure the rolls while cooking and then remove before serving. You may wonder why we use salted salmon instead of raw salmon. Since color plays an important role in presentation for osechi ryori, the distinct pink of salted salmon makes the ideal choice to accent the kombu roll. Salted salmon also has a less fishy taste and the flesh is much firmer for wrapping. You can find salted salmon in Japanese grocery stores, so if you live near one, check out the store to save time from making your own Salted Salmon. Otherwise, you can make salted salmon on your own. I highly recommend making a big batch as they are so delicious and you can also make Salmon Fried Rice and Sanpeijiru (Salmon Soup) with the salted salmon. If you decide to use raw salmon, use 2 tablespoon of sake to sprinkle over salmon at the step where we de-salt for salted salmon. Sake removes and masks fishy smell, and this might help a little bit. Do take note that regular cooked salmon will not work well in making kombu rolls as it may have albumin formation (white foam) which can ruin the appearance of the dish. If you prefer a vegetarian/ vegan version, you can definitely do without the salmon and just roll up the kombu itself without any filling. 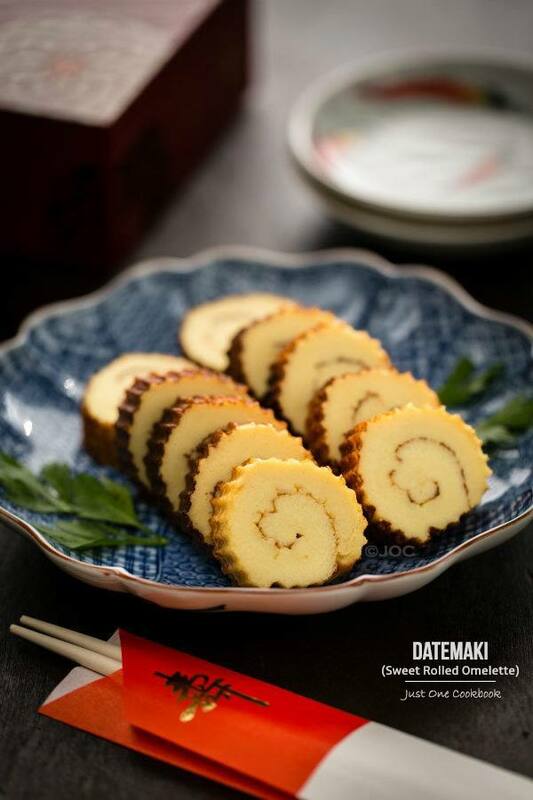 In Osechi, kobumaki 昆布巻きwith or without filling are both common and equally delicious. With an emphasize on beauty and fine details, these Salmon Kombu Rolls are such beautiful exemplification of traditional Japanese cuisine. I hope you enjoy making this recipe. If you wish for more happiness in the coming year, follow the Japanese tradition, and eat more kombu dishes on New Year’s Day! Soak the kombu in 5 cups of water for 30 minutes. Reserve this kombu water (aka Kombu Dashi) as we will be using it for cooking later. Soak kanpyo in water for 15 minutes and drain. Quickly rinse kanpyo under running water and rub it with 1 tsp kosher salt. Rinse again and drain well. In a flat container, add 2 cups of water and 1 tsp kosher salt. Place the salmon fillets and set aside for 30 minutes to de-salt the salmon. Remove the salmon from the salted water and gently pat dry with paper towel. Using a sharp knife, remove bones off the salmon (if there is any on your fillet). If you have kitchen tweezers, they help remove the bones from the flesh very easily. Finally remove the skin. Cut the salmon fillets into a roughly 3.5” x ¾” log shape (or any shape that is easy to roll up in the kombu). The width of salmon should match with the width of kombu. 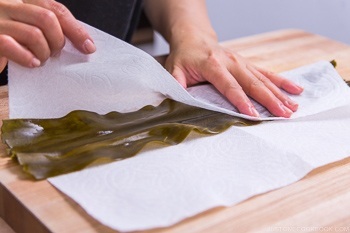 Wipe off the excess moisture on kombu with paper towel. Wrap the log shaped salmon with kombu. Pull up the other end of kombu a few times as you roll tightly. Once all the kombu is rolled up, tie each one with kanpyo. Depends on the width of kombu, you might need to make 1 to 3 ties. Think about the final serving size and decide on the location of the knots. Here each kombu makes 2 salmon kombu roll pieces as I would be cutting each roll in half. Therefore, I’d need 2 ties/knots. 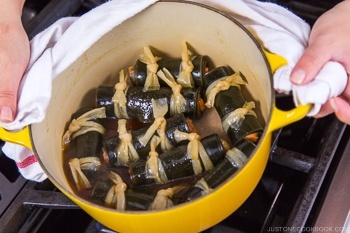 Place the kombu roll in a large pot (I use Le Creuset 3.5 QT). Add the reserved kombu dashi until kombu is fully submerged. You don’t have to use all of the kombu dashi, but save it just in case you need to add more liquid later. Add sake and rice vinegar. Place the Otoshibuta (drop lid - see how we can make it with aluminum foil) on the salmon kombu roll. We do not use a regular lid throughout the cooking process. Once boiling, skim off the foam and scum on the surface. Then cook on gentle simmer for 1 hour. Insert a wooden skewer to check if the kombu has become tender. Once it’s tender, add sugar and half of the soy sauce (1.5 Tbsp). 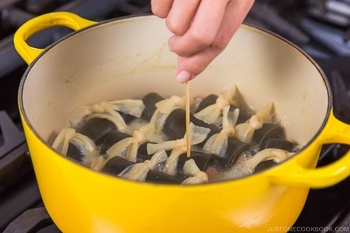 Instead of using utensils (that can potentially break down the kombu), hold the pot and swirl it around to mix the seasonings and coat with the food. Cook covered (with otoshibuta) on simmer for 15 minutes. Add mirin and the rest of soy sauce (1.5 Tbsp) and cook (covered with otoshibuta) on simmer for another 10 minutes, or until the cooking liquid is almost gone. Once it’s done cooking, remove from the heat and let cool. Once cool enough to handle, cut the kombu in half (if you have 2 ties). If you like, cut off both ends for better presentation. Serve at room temperature in Osechi Ryori. 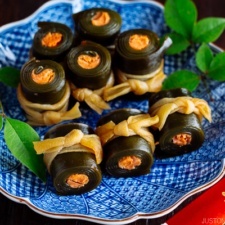 Store in the refrigerator for up to 7-10 days and you can also freeze the kombu roll. Hidaka Kombu: Among all the different kombu, Hidaka Kombu is known for its tender texture after rehydration. This kombu also cooks and becomes tender faster than other kinds. 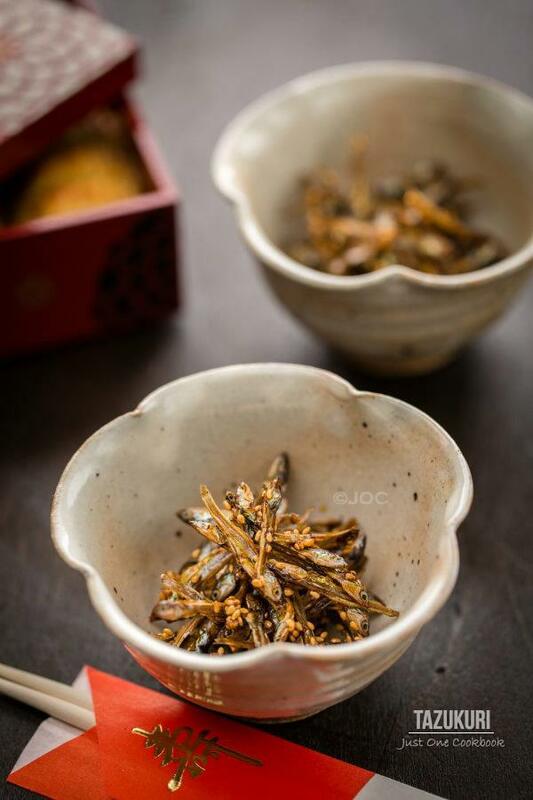 Would using kombu that has been used to cook dashi greatly affect the taste of this dish? Most people seem to discard the kombu after cooking dashi, but it feels pretty wasteful to me. This recipe seems like the answer to reducing kombu waste! I want to ask, how should they be stored in the fridge? Just put it into an airtight container? Would they store well in the rest of the cooking liquid to maintain more flavor, or would that just make them gooey and soggy? For now, I put mine into a glass food storage container (with airtight plastic lid) and I put a piece of cling wrap directly over the rolls inside to try to keep moisture in them. Also, my best tip for anyone new to this recipe: The kanpyo gets very soft after cooking! Be careful removing and cutting the rolls. I had a few fall apart in the process because the kanpyo broke (one stuck to the pan for some reason, the other I accidentally hit with the edge of the otoshibuta). And thanks so much for sharing your tip with us!